DURHAM, N.C. -- Humans did not invent the wheel. Nature did. While the evolution from the Neolithic solid stone wheel with a single hole for an axle to the sleek wheels of today’s racing bikes can be seen as the result of human ingenuity, it also represents how animals, including humans, have come to move more efficiently and quicker over millions of years on Earth, according to a Duke University engineer. Adrian Bejan, professor of mechanical engineering at Duke’s Pratt School of Engineering, argues that just as the design of wheels became lighter with fewer spokes over time, and better at distributing the stresses of hitting the ground, animals have evolved as well to move better on Earth. 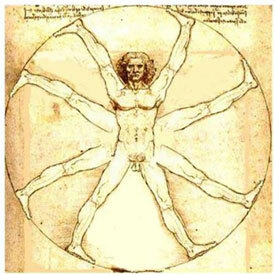 In essence, over millions of years, animals such as humans developed the fewest “spokes,” or legs, as the most efficient method for carrying an increasing body weight and height more easily. “This prediction of how wheels should emerge in time is confirmed by the evolution of wheel technology,” Bejan said. “For example, during the development of the carriage, solid disks were slowly replaced by wheels with tens of spokes." vehicle posed on the axle. Bejan’s analysis was published early online in the American Journal of Physics. His research is supported by the National Science Foundation and the Air Force Office of Scientific Research. Bejan believes that the constructal theory of design in nature (constructal.org), which he started describing in 1996, predicts these changes in the wheel and animal movement. The theory states that for a design (an animal, a river basin) to persist in time, it must evolve to move more freely through its environment. Since animal locomotion is basically a falling-forward process, Bejan argues that an increase in height predicts an increase in speed. For a centipede, each leg represents a point of contact with ground, which limits the upward movement of the animal. As animals have fewer contacts with ground, they can rise up higher with each stride. “The constructal theory shows us this forward-falling movement is dictated by the natural wheel phenomenon, which is required for the minimal amount of effort expended for a certain distance traveled,” Bejan said. An earlier analysis by Bejan showed that larger human swimmers are faster because the wave they create while swimming is larger and thus carries them forward faster. While wheel-like movement evolved naturally, it also describes what Bejan likes to call “nature’s gear box.” Humans have two basic speeds, Bejan said – walking and running. A running human gets taller, or higher off the ground, with each stride, which increases his speed. A horse has three speeds – walk, trot and gallop.